This product contains whole broth culture suspension of Clostridium chauvoei (local isolate) killed by formalin 0.7% (final concentration) and precipitated by 1% Aluminium potassium sulphate (final concentration). 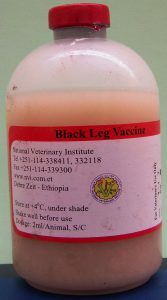 It is a liquid vaccine available in 100 ml vial for 50 doses. Avoid light and heat contact. – Cattle (including calves) 2 ml subcutaneously on the neck region. – Shake vigorously before use. – Immunity develops in 10 days after vaccination.